THE ULTIMATE TOOL BOX, FROM 6" TO 15"
The CineMonitor HD Evolution reaches new heights in manufacturing quality with precision milled aluminum housings fully sealed (no holes or noisy fans), state of the art optical glass protecting the screen and galvanic insulation. 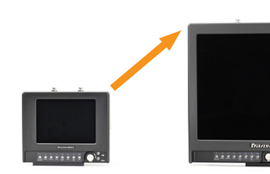 The Cine Monitor HD Evolution features unique tools, such as the Lens Reader, that reads and displays in real time the lens metadata of /i and LDS lenses. It also includes a Cine Tape Measure communication to display in real time the measured distance. OUTDOOR OR STUDIO, FROM 6" TO 15"
Up to 9 models available among 6", 8", 10", 12" and 15" diagonal screen size. SBL , eSBL and X-SBL are designed to be used in full sun without hood wile maintaining details in both dark areas and highlights.